Disclaimer: I have received this book as a free review sample, with the only requirement that I would write a review of it here on my blog. The reviews published here are my own views and I was in no way obligated to write positive reviews. Recently I got an opportunity to review a book "Implementing Cloud Storage with OpenStack Swift", published by Packt Publishing, and I must say, the book doesn't disappoint at all. The book is co-authored by three storage technologists having immense years of hands-on design and implementation experience among them; Amar Kapadia (BLOG: http://www.buildcloudstorage.com/), Sreedhar Varma and Kris Rajana. Chapter 1: Cloud Storage – Why Can't I be Like Google? This Chapter introduces the readers with the concept and requirement for cloud storage along with a quick introduction of OpenStack Swift. The second Chapter as the name suggests, deep dives into the OpenStack Swift Architecture. It highlights some of the key architectural principles behind Swift's design and also discusses some of its major functions and functionalities. The Chapter walks the readers through a simple way of performing a multi-node Swift installation and how to set it up along with the Keystone setup for authentication. This Chapter describes how users can access the Swift object storage by using a variety of tools such as the Swift Client CLI, cURL, REST APIs and even with AWS S3 APIs. The Chapter provides details on the various options that are available to monitor and manage a Swift cluster. Some of the topics covered in this chapter include StatsD metrics, handling drive failures, node failures, and migrations. The Chapter provides readers with critical pointers that one should keep in mind when selecting the correct hardware for your Private Cloud setup. This walks you through a performance benchmarking tool and the basic mechanisms available to tune a Swift cluster. Users utilizing Swift will need to tune their installation to optimize performance, durability, and availability, based on their unique workload. 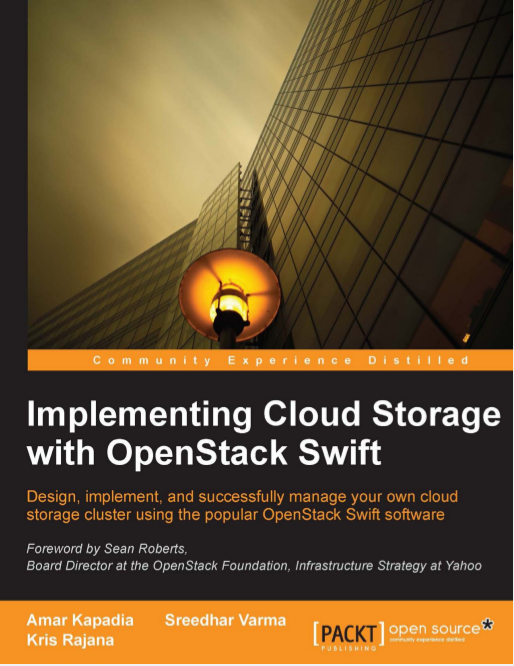 This Chapter provides some interesting use cases for Enterprises looking to implement OpenStack Swift. It also provides a quick look into several Operating Sytems, virtualization Platforms, Distribution and Monitoring tools that are being used across various Swift depolyments. While the subjects that are covered are for sure complex and detailed, the authors have done an excellent job creating content that is easy to read and retain. With the addition of the design examples you are sure to walk away from this book with the knowledge to implement the most advanced of Openstack Swift's features.. in short.. a must read. The book is available in both eBook and Print versions from Packt Publishing.